Dogs have a lot of needs, and as a pet parent, your goal is to ensure that all of those needs are met. Of all the things that you do for your four-legged pal, feeding him a well-balanced diet that meets his nutritional needs is the most important. Just like humans, canines have to receive the right vitamins and minerals that they require in order to thrive. At first glance, selecting a dog food for your pooch seems like it will be an easy task. But, on further investigation, most pet parents find that choosing a pet food formula is a bit daunting. There are so many different dog food options on the market, and just as many recipes, which can make it hard to narrow down the options and pick a product that will fully support your furry friend’s unique dietary requirements. From dry dog food to wet dog food, and from a myriad of blends, like grain free dog food and high protein dog food, it can be really challenging to decide which option to choose. Add to that the fact that not all makes of dog food are created equal and finding the best option can be a serious challenge. But there are many dog food brands that have a great reputation. Royal Canin is one of them. Famous for offering a variety of formulas that are designed to meet the nutritional needs of all pups, and for using premium quality ingredients, many pet owners rely on Royal Canin to nourish their dogs with the vitamins, minerals, and nutrients that they need to thrive. While all formulas made by Royal Canin are excellent, some are better than others. We have examined all of their recipes and fully assessed the ingredients they are made of to determine which Royal Canin foods are the best of the best. Our team has narrowed down the options to five specific formulas. Now that you have had a look at our top choices, let’s take a closer look at each one. Below, we offer a detailed description of each formula, including the ingredients they contain, what we like about them, and what other pet owners who have fed these recipes to their dogs have to say. After you read through the reviews and decide which food will best meet your furry pal’s nutritional needs, click on the buttons to find the best prices currently available on Chewy and Amazon. If you have a medium sized adult dog, such as a Beagle, a Boxer, or a Cavalier King Charles Spaniel, it’s important to feed your furry pal a food that is specially formulated for his size. Medium sized dogs have different nutritional needs than small and large dogs, and Royal Canin Size Health Nutrition Medium Adult Dry Dog Food is made to meet those needs. This food is made for dogs that weigh between 21 and 55 pounds and are between the ages of 12 months and 7 years old. Made with high quality ingredients and infused with a wealth of nutrients to support your medium sized dog’s overall health and well being, this formula will ensure that your pooch is getting the nutrition that he needs to support optimal health. The recipe includes Omega 3 and Omega 6 fatty acids, antioxidants, prebiotics, and minerals that are proven to improve digestion in medium breeds. It also features essential vitamins and minerals to improve the health of his immune system and support the health of his skin and coat. A moderate amount of protein will help to maintain your pooch’s muscle mass and strengthen his muscles and joints while also helping him maintain a healthy weight. Royal canin specifically made this dry dog food to improve dental health, as it encourages more chewing and reduces the buildup of tartar. While it does contain grains like corn and wheat, if your pup isn’t sensitive to these ingredients, he shouldn’t have a problem with them. Most pet parents who feed this food to their medium sized pups say that their four-legged friends’ love the taste and that they are pleased with the results. 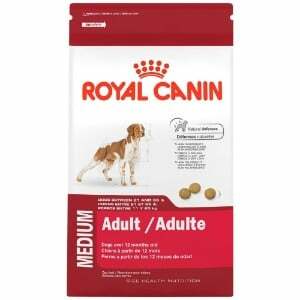 Final Verdict: For medium sized dogs, Royal Canin Size Health Nutrition Medium Adult Dry Dog Food is a great choice. This food is specifically to meet the nutritional needs of dogs who weigh between 21 and 55 pounds and contains a balanced blend of essential vitamins and minerals that dogs of this size need to maintain optimal health. If your pooch has tummy troubles, whether it’s because he has a sensitivity to certain ingredients or simply because of age, you should consider feeding him a specially formulated dog food for sensitive stomachs. Royal Canin’s Maxi Nutrition Sensitive Digest Dry Food for Dog is the perfect food for pups’ that have stomach issues. Made to improve digestive health, this formula will help to ease any tummy problems that your pooch may be experiencing; from constipation to diarrhea and everything in between. 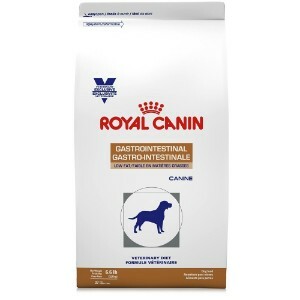 Made with proteins and carbohydrates that are easy to digest, and infused with nutrients that are proven to improve digestion, like prebiotics, this formula from Royal Canin will help to sooth tummy woes. In addition to easing sensitive stomachs, this recipe is also made to support joint health. That’s because it contains ingredients that have been found to improve the development of lean muscle mass, which is directly linked to reduce inflammation and pain, thereby boosting mobility. It’s also formulated with a wealth of vitamins and minerals that will improve your pup’s overall health, such as vitamin A, B vitamins, potassium, calcium, zinc, copper, and vitamin D. This food is formulated for adults and mature large breeds between 56 and 100 pounds, so it’s certainly an option to consider for dogs that have fully matured. Final Verdict: Our panel of experts and the majority of pet parents that use Royal Canin Maxi Nutrition Sensitive Digestion Dry Food for Dog say that this formula does help to improve stomach issues. They have also found that it boosts joint health and enhances mobility in large breeds that suffer from hip and elbow dysplasia, such as Mastiffs, Saint Bernards, and Rhodesian Ridgebacks. For dogs who are suffering from gastrointestinal disorders, such as pancreatitis, high levels of unhealthy gut bacteria, or deficiencies in the production of bile acid, Royal Canin Canine Gastrointestinal Low Fat Dry can help to ease those issues. Since it’s a low-fat formula, it’s easy to digest. It also contains chelated minerals, so your pooch will be able to easily absorb the nutrients that this provides into his system to maintain his overall health. It also has a lower fiber content than many other dog food formulas, which further helps to reduce digestive woes that canines experience. The majority of dog foods that are on the market are made with high levels of fat, which can be difficult for canines’ that suffer from digestive issues to process. This low fat formula was specifically made by animal nutritionists to reduce the fat content so that your pooch will have an easier time processing all of the wholesome goodness this recipe contains. It’s also infused with a wealth of essential vitamins, minerals, and other nutrients that your pet needs to maintain his overall health. The majority of the Royal Canin reviews from pet parents who feed their dogs’ this recipe said that they have seen positive results. Final Verdict: Royal Canin Canine Gastrointestinal Low Fat Dry food is specifically made for dogs that suffer from gastrointestinal issues. It has a low fat and low fiber content, so it’s easy to digest and won’t cause stomach upset. Additionally, since it is a low fat formula, it can also be considered a dog food for weight loss, as it will help your pet maintain a healthy weight. For pet parents who are looking for complete balanced nutrition for their medium sized puppies – such as a Brittany, an English Springer Spaniel, or a Cocker Spaniel, Royal Canin Puppy Dry Dog Food is an excellent option to consider. Puppies have different nutritional needs, and Royal Canin fully understands those needs. This manufacturer also understands that the dietary needs of puppies of different sizes also vary. 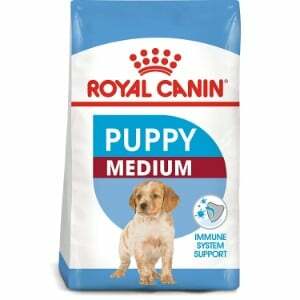 That’s why they made this formula to specifically support the healthy development of medium sized puppies. Formulated for dogs that are up to 1 year old and are expected to reach be between 23 and 55 pounds when they reach maturity, this recipe offers the balanced nutrition that your puppy needs to thrive. It features key nutrients that puppies need to support their rapid growth during this stage of life. It also contains an exclusive blend of vitamins, minerals, and antioxidants to foster optimal development of all of your puppy’s systems, including his eyes, brain, immune system, and musculoskeletal system. It is infused with prebiotics to improve digestive and proteins that support the health of a growing puppy’s joints. It also contains the precise amount of carbohydrates to provide young medium breed dogs with the energy that they need. It’s a grain free dog food, too, as it is completely free of corn, wheat, and soy, which further aids in digestion. Final Verdict: Royal Canin Puppy Dry Dog Food is specifically formulated for medium breed dogs that are up to 1 year old. It offers all of the vitamins and minerals that medium sized dogs need during puppyhood to promote healthy development during this stage of life. A dog’s nutritional needs change as he ages. He needs the right blend of nutrients to support his digestive health, cognition, joint health, and immune system. That’s why it’s important to feed your pet a senior dog food once he reaches his Golden Years. Royal Canin Canine Health Nutrition 8+ in Gel Wet Dog Food is the perfect choice for fully matured dogs. Not only does it offer a precise blend of vitamins and minerals that older dogs need, but since it’s a wet dog food, it’s easier for mature dogs that may have dental health issues to consume. Plus, wet food formulas are more palatable, so if your senior pup is a finicky eater, he’ll likely enjoy the flavor of canned food over dry food. 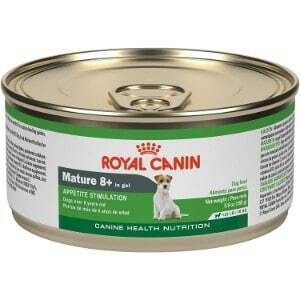 This canned food is made specifically for dogs that are 8 years of age or older. It’s formulated with all of the essential nutrients that older canines require, and it also has a lower phosphorus level, which helps to support kidney health. Most pet owners report that their senior four-legged pals love the taste and that they see a distinct difference in their overall health and well being. Final Verdict: Royal Canin Canine Health Nutrition Mature 8+ in Gel Wet Dog Food is made specifically for mature adult dogs. It’s packed with the nutrients that senior dogs need for balanced nutrition and offers a robust flavor that your pet will love. When you’re shopping for pet food for your dog, you’re going to find that there are a lot of options to choose from. There are tons of different brands on the market, like Blue Buffalo dog food, Purina dog food, Taste of the Wild dog food, and Rachael Ray Nutrish dog food – just to name a few. With so many choices, it can be hard to decide which brand you should fill your pup’s dog bowl with. While all of the aforementioned dog food brands are premium quality, they also tend to have high price tags. If you’re looking for a high quality dog food that is nutritionally balanced and doesn’t cost an exorbitant amount of money, then Royal Canin is definitely an option worth considering. If you’re not familiar with this brand and you are wondering why pet parents, animal nutritionists, and veterinarians recommend it, read on to find out more about Royal Canin dog food. Royal Canin was created in 1968 by Jean Cathary, a veterinarian. Dr Carthy was passionate about pet care and wanted to offer them a pet food that was scientifically proven to offer canines the nutrition that they need to thrive; hence, he created Royal Canin. This dog food manufacturer is located in France, where its prime headquarters are located, but there is also a headquarters located in the United States, in St Charles, Missouri. Royal Canin is a global pet food brand and pet parents around the world rely on this brand to nourish their canine companions. Their foods are based on the principles of science and the formulas they create are made to offer pets of all ages, sizes, breeds, and life stages the balanced nutrition that they require. The primary reason why pet parents should consider feeding their four-legged family members Royal Canin is simple: this company truly puts the dietary needs of dogs first. Unlike other pet food manufacturers that create their formulas based on what humans are looking for, Royal Canin has the best interest of pets in mind. To that end, all of their recipes contain the nutrients that canines of all ages, sizes, and breeds need to thrive. Their formulas are founded on science, not the latest trends in pet food diets, and they continue to stay abreast of the latest research to ensure the formulas they create will truly provide the nutrition that dogs need. Royal Canin partners with animal nutritionists and veterinarians who are also passionate about pet care to develop the most well-balanced, complete formulas for dogs. They also offer a variety of recipes that are made for all ages and stages of life, as well as for specific breeds and sizes. It is for these reasons that pet parents have been entrusted the health and well being of their furry family members to Royal Canin for nearly 50 years. Royal Canin makes a wide range of dog food formulas, and all of them offer balanced nutrition. So, how did we narrow down the options to just five recipes? We wanted to offer our readers a well-rounded selection of food choices for their pets during all stages of life. With that in mind, we enlisted the help of veterinarians and animal nutritionists, we helped us carefully analyze the ingredients offered various Royal Canin foods. We also read through dozens of Royal Canin reviews that pet parents who use this brand of food shared. Based on our findings, we were able to narrow down the options to the five formulas that are listed in our review. We are confident that each option will offer your pet the nutrition that he needs to thrive during all stages of his life – from puppyhood to his senior years. Royal Canin is a premium quality pet food that is based on scientific research to offer dogs the vital nutrition that they need to thrive. Each product mentioned in our review has been carefully analyzed and will certainly meet the needs of your pooch. However, no matter which Royal Canin recipe you choose, you can have confidence knowing that the dietary needs of your four-legged family member will be met.